The King has arrived! It’s finally Black Panther week, and if you’re like me that means it’s time to party! New Marvel movies are definitely something to celebrate in my house and truth be told, we’ve been celebrating Black Panther for a while already. Jerry and I screened the movie last night and I’m sharing all our no-spoiler thoughts and whether or not you should bring the kids to the theater. But before I put on my mom hat, I need a moment. Y’all. Black Panther was incredible. From the actors to the sets and the costuming (omg the costumes! ), Black Panther was not just a movie. It was an experience. I felt every emotion I have at some point during this film and I want to say so much about it, but it’s nearly impossible without spoilers! Here’s something you may not know about me; I’m white. (oops, spoiler!) And leading up to the release of Black Panther, I listened as my black friends shared about how exciting it is to see a beloved black superhero and full supporting cast in a feature length Marvel movie. I nodded my head believing I could imagine what they meant. From what I know and love about the MCU, Black Panther was going to be a fun journey. I was excited too. There’s a line early on in the film where T’Challa’s mother (Angela Bassett why don’t you age??) says, “it is your time”. That phrase was the through line for the entire movie and it just keeps looping in my head. Black Panther is a celebration of African culture and history but also a bright light shone on centuries of oppression and pain. Watching felt like I had been invited to an intimate family come-to-Jesus on what happens next as a culture. This was not my story. But I didn’t want it to end. I was stunned at how seamlessly real-world struggles were woven into this comic book movie. There wasn’t a single under-developed character. Villains and heroes alike were diverse in thought, complex in motivation and drawing some very real-world conclusions in the process. There were audible reactions to many moments that sometimes took my breath away. Visually, this movie was a feast. If you’re reading this, I probably don’t need to convince you to see it. But see it. The hype is real for a reason. Black Panther is not just another fun Marvel movie. It’s a great movie, period. But as a parent, can you feel good about taking your kids to watch on the big screen? This post contains affiliate links which means I may earn money when purchases are made. A couple weeks ago my sons wanted to spend a little bit of allowance money they had saved up and after much deliberation they both ended up with Black Panther toys. Calvin went with an awesome Legends Black Panther action figure and Oscar grabbed this sweet Rhino face-off LEGO set. We’ve been watching the trailers, admiring the amazing costumes (can’t shut up about this) and having all kinds of conversations about how cool Black Panther is so their choices didn’t surprise me at all. It’s safe to say the movie has been highly anticipated in this house. But like many parents of 9 and 6-year-olds, we wanted to see Black Panther before taking them to be sure there wasn’t anything we weren’t ready for them to see. Marvel is a funny beast sometimes. There is so much marketing to draw in the kiddos but sometimes the movies are just too much. As a grown-up, I don’t want to change a thing. But as a mom it can be tough to walk the line of here play with this toy buuuuut, wait five years to see the movie. What is Black Panther about? If you are a comic book reader, you’ve known Black Panther since the 1960s. The rest of us got to meet him in Captain America: Civil War and I loved his character right away. This movie is what happens next and is what I would call Black Panther’s origin story. 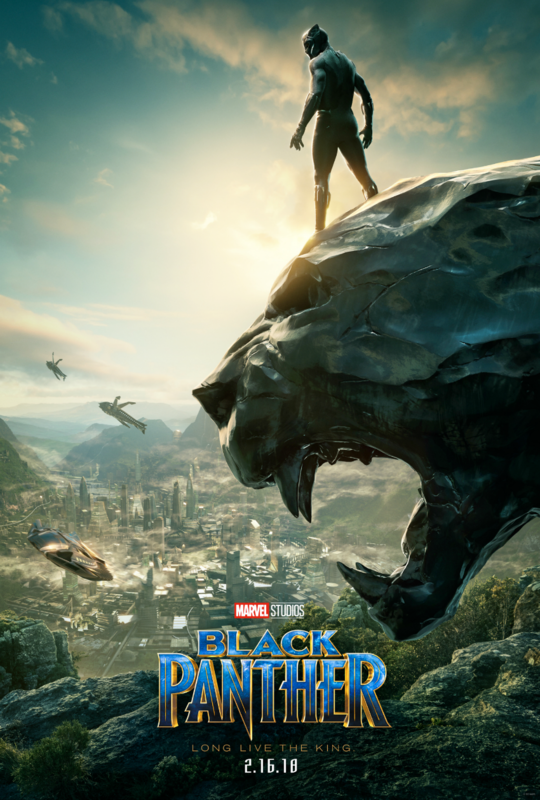 OFFICIAL: Marvel Studios’ “Black Panther” follows T’Challa who returns home to the isolated, technologically advanced African nation of Wakanda to become king, but when a powerful old enemy reappears, T’Challa’s mettle as king—and Black Panther—is tested when he is drawn into a formidable conflict that puts the fate of Wakanda and the entire world at risk. I call myself a Marvel fan but truth be told, it’s mostly on-screen. I didn’t read the comics growing up and I can’t take the time to read them now. For me, the movies are doing a fantastic job telling these stories and I am here for it. I love the action and the humor and hunting for everyone’s favorite cameo, Stan Lee. That said, I know many people who have been Black Panther fans for decades and it must be thrilling to see him come to life on screen like this. The man I sat next to at the screening for instance, was coming out of his chair. His energy was definitely contagious! If you’re a Marvel fan already, you know that the movies are not one size fits all when it comes to kids’ viewing. To give you an idea of our personal lines, we think The Avengers, Thor (the first one), Spiderman Homecoming and The Incredible Hulk are relatively okay (even still pushing it a bit). But we’re going to wait a while longer on Guardians of the Galaxy Vol. 1 and 2, Thor: Ragnarok, Civil War and most of the others before the kids see them. For us, it comes down to hand-to-hand combat. It seems a bit more logical to suspend reality when people are flying around and the music is loud and everyone is just sort of running. But when things get up close and personal, punches are thrown (or knives or spears) and there is actual personal up-close violence, I prefer to wait. So here’s where we stand on Black Panther when it comes to kids. I’m definitely the more conservative movie-watcher in the family so I tend to lean toward the wait and watch later group. But, we’re also finally getting to a place where we can all enjoy the theater without a million potty breaks or interruptions so I was really hoping we could enjoy Black Panther in the theater with the boys. One of our fondest family memories was watching Spider-Man Homecoming while on a Disney cruise last year. The truth is, Black Panther is an absolute thrill to watch, but the violence is definitely beyond our threshold for our boys at this age (6 and 9). There are at least 3 specific violent deaths that cross my line and the war scenes are well…war. On the 30 minute drive home, Jerry and I agreed that Black Panther the film will have to wait. I’m not looking forward to breaking the news to my boys that this is a wait and see movie for them, but it’s the decision we feel comfortable with for now. That said, you may feel differently. Many kids will see this movie in the theaters and many parents will want their kids to see it. If your kids are under the age of 11, my recommendation is to screen it first. And really, you’ll want to do this anyway so you can fully enjoy it. See the movie and decide what your own child can handle. And if you choose to take them, it’s a bonus viewing for you! 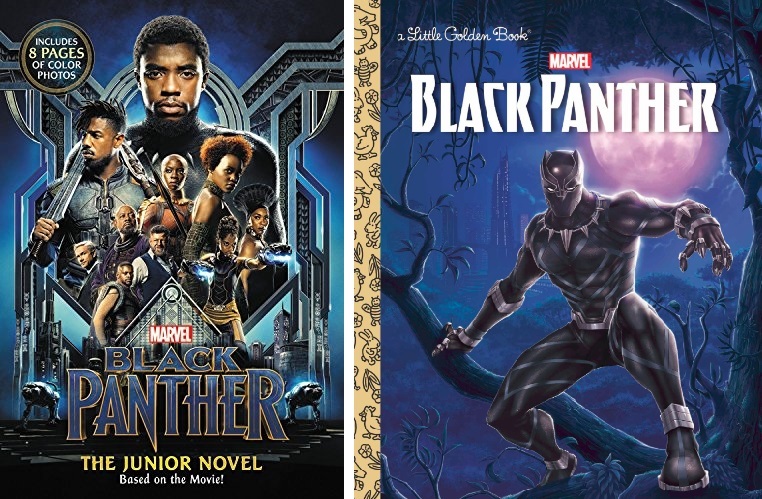 As a peace offering to the boys, I bought the Black Panther Junior Novel for Oscar and the Little Golden Book for Calvin so they can at least learn the story and be a part of the fun. I know, I know: it won’t be enough. At the end of the day, Black Panther is a must-see movie for most people and a welcome addition to the MCU. We think it will be great fun for anyone age 11 and up and we can’t wait to see more T’Challa in Avengers: Infinity War. PS. Don’t forget to stay all the way through the credits for not one, but two extra scenes! 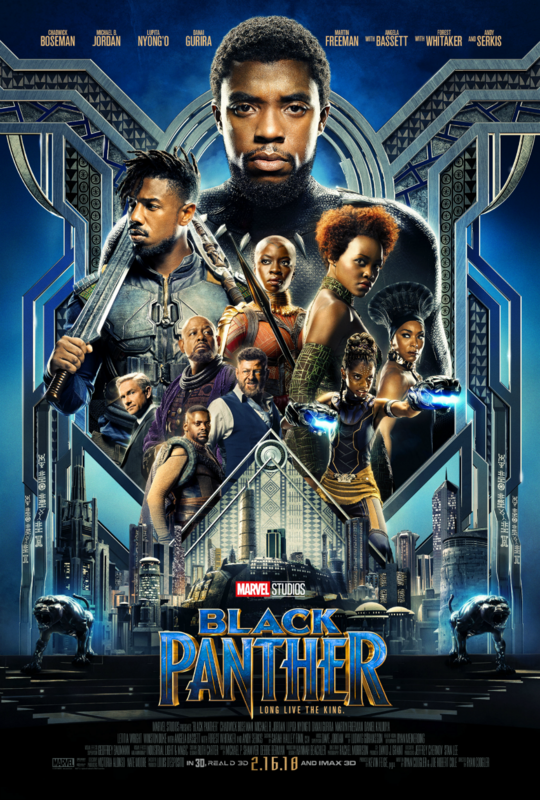 Black Panther is rated PG-13 and is 134 minutes long. In theaters February 16, 2018! Keep up with the latest Marvel news on Twitter. Was this review helpful? Please share with your friends or pin and save it for later! Our whole family is so beyond excited to see this movie. Thanks for the detailed review – so helpful when considering the kids. You are so welcome! I’m so excited about this movie. I can’t wait to see it again. Let me know what you think when you see it! What a great review! And you’re right, it’s time! Thanks so much! There is SO much more I want to say. But I want everyone to have the same experience I did! !